If you are still doing the manual method of watering lawns and other plants in the landscape, you should contact Design West Landscaping today. We can provide you with well-designed and efficient irrigation systems. Our team is composed of every professional you'll need for irrigation design, installation, and repair. It is no doubt that the sprinkler system is the most common of irrigation systems. Whether you are in Brentwood, Clements, or Danville, almost all landscapes depend on that type of system. We cannot argue with its efficiency…if that's for the lawn grasses. In fact, we recommend rotor rain sprinkler and variable mini sprinkler for lawns. However, your landscape also has ornamental plants, shrubs, trees, and maybe, even vegetables. Each of these requires a different kind of system. That's why there must be the perfect irrigation design. Trees are best with drippers, drip spikes, mini bubbles, and spray jets. Shrubs are better with the shrubber spikes, pop-up sprinklers, or variable sprayers. The same goes for other types of plants. Don't forget that the location of these plants affects the choice of irrigation systems. For example, drippers and sprayers are great for pots and planters, but jets and sprinklers are just bad for them. Our irrigation design also takes into consideration the aesthetics appeal. You surely don't want any pipe or hose to be messing around the perfect garden. We'll design your system in a way that it is kept invisible while getting its job done. Irrigation installation involves digging, pulling, burying, and getting wet. It's a messy and complicated job that should be left only to professionals. Otherwise, you will be left disappointed with all the mess waiting for you to clean up, not to mention the financial fiasco that doing it yourself could bring. At Design West Landscaping, we have professional landscape irrigation installers who can properly build an efficient system for your lawn and landscape. Besides our experienced team, we also use only the premium products and supplies that can withstand the test of time and nature. These products are proven superior from their peers and can guarantee optimum performance at all times. And since we've been in this business for decades, expect us to use nothing but the most competent tools and equipment for any landscape irrigation installation project. Perhaps you already have an irrigation system installed. But is it working perfectly? Or does it need an irrigation repair? Maybe some parts of the landscape, especially the slopes and hills, are not watered properly. Maybe there are types of plants that need more water. Or, maybe, the landscape is oddly shaped, that it's difficult to water everything. Don't worry. We have a solution for every situation. 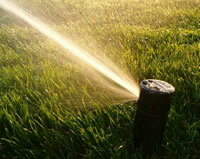 Our technicians are well-trained and have vast experiences when it comes to irrigation repair. This service is not limited only to improving the current design. You can also depend on us when it comes to repairing every little problem in the system. Whether you need an irrigation design, installation, repair, or all of these, no other landscape company in the Northern San Joaquin Valley and East Bay area can provide the same level of expertise and outstanding results than Design West Landscaping. Contact us for estimates, references, and consultation.